Source: U.S. Energy Information Administration, Form EIA-860M "Monthly Update to the Annual Electric Generator Report." Note: Data are preliminary and include all generators at plants >1MW in capacity, from the electric power, commercial, and industrial sectors. "Other renewables" includes hydroelectric, geothermal, landfill gas, and biomass generators. States are listed by postal code. During the first half of 2012, 165 new electric power generators were added in 33 states, for a total of 8,098 megawatts (MW) of new capacity. Of the ten states with the highest levels of capacity additions, most of the new capacity uses natural gas or renewable energy sources. Capacity additions in these ten states total 6,500 MW, or 80% of the new capacity added nationally in the first six months of 2012. Most of the new generators built over the past 15 years are powered by natural gas or wind. In 2012, the addition of natural gas and renewable generators comes at a time when natural gas and renewable generation are contributing increasing amounts to total generation across much of the United States. In particular, efficient combined-cycle natural gas generators are competitive with coal generators over a large swath of the country. And, in the first half of 2012, these combined-cycle generators were added in states that traditionally burn mostly coal (with the exception of Idaho, which has significant hydroelectric resources). Only one coal-fired generator was brought online in the first half of 2012, an 800-MW unit at the Prairie State Energy Campus in Illinois. In its 2011 annual survey of power plant operators, the U.S. Energy Information Administration (EIA) received no new reports of planned coal-fired generators. Of the planned coal generators in EIA databases, 14 are reported in the construction phrase, with an additional 5 reporting a planned status but not yet under construction. However, only one of the 14 advanced from a pre-construction to an under-construction status between the 2010 and 2011 surveys. More small generators were added than large generators: of the 165 generators added, 105 were under 25 MW. Many of these use renewable energy sources, most commonly solar and landfill gas; wind plants aggregate many individual turbines into one large "generator" for reporting purposes. So far, 2012 has also seen a significant number of new peaking generators, the combustion turbines and internal combustion engines that operate when electric demand is at its highest, which also tend to be on the small side. These technologies are usually fueled by natural gas or petroleum, but can also burn landfill gas (Michigan alone added 8 of these in the first half of 2012) or agricultural byproducts. In Texas, which is facing a shortage of generating capacity reserves, 70% of the capacity added was in the industrial sector and not the electric power sector: the Formosa Plastics Corporation added two generators burning petroleum coke. Source: U.S. Energy Information Administration, Form EIA-860 "Annual Electric Generator Report" and Form EIA-860M "Monthly Update to the Annual Electric Generator Report." Note: 2011 and 2012 data are preliminary. Data include all generators at plants >1MW in capacity, from the electric power, commercial, and industrial sectors. Solar has shown significant growth in the electric power sector over the past two years. From the beginning of 2010 to the end of June 2012, 1,308 MW of new utility-scale solar capacity has come online, more than tripling the 619 MW in place at the end of 2009. Despite this significant increase, these additions understate actual solar capacity gains. Unlike other energy sources, significant levels of solar capacity exist in smaller, non-utility-scale applications (e.g., rooftop solar photovoltaics). These appear in a separate EIA survey collecting data on net metering and distributed generation. 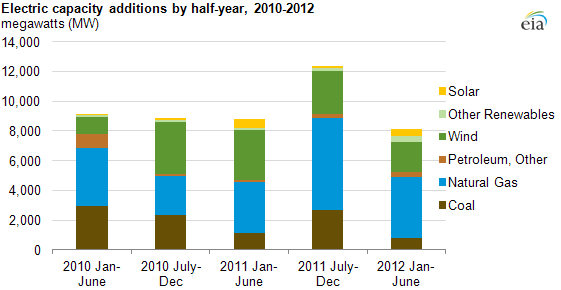 More capacity was added in the first half of 2012 than was retired. A total of 3,092 MW was retired, from 58 generators in 17 states. Over half of this was coal, and another 30% was petroleum-fired generators. Two recent Today in Energy articles address future coal generator retirements, both as reported by powerplant owners and operators, and as projected by EIA as part of a long-term forecast. Detailed data on each generator addition and retirement are available in the Electric Power Monthly (in tables ES3 and ES4, respectively). These data represent responses to EIA's monthly update survey of existing electric generators. An annual survey will collect final data from all industry participants early next year.